Camp started Saturday January 26 and ran through Monday January 28. Each day offered several hours of gymnastics training, plus the opportunity for some meals with camp folks. We even had a watch party in a banquet room during which we watched UCLA take on Stanford. Recreational and Competitive Gymnasts gather alongside Beginner gymnasts for 13 hours of instruction, meals out on the town, and a clinic by International Clinician Tony Retrosi of GymMomentum: PUTTING IT TOGETHER–Getting the most out of your drills. James Parent of TumblTrak will also be on staff helping these adult gymnasts. We are still accepting campers on a first come basis. Click PLAY or watch 2017 highlights on Vimeo. May 18-20, 2018 at the Flipfest Camp in Tennessee. 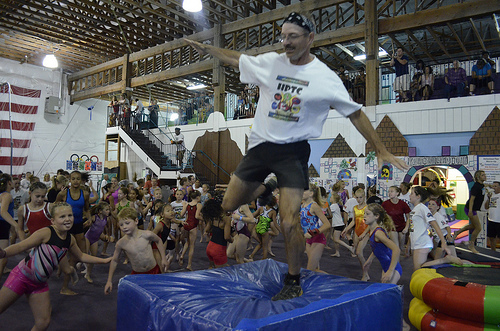 International Gymnastic Camp in Pennsylvania is one of the most famous in the world. But they offer programs for non-competitive kids too. Every program needs a system. Learning the Hard Way – How to Welcome Kids to Camp! Summer Camp at Victory Gymnastics. … 30 athletes came together in Portsmouth NH from the U.S. and Canada for the experience of a lifetime. Every single gymnast made noticeable improvements with their skills and made lifelong friends in the process. Many gymnasts were returning from previous camps, making the experience a reunion of sorts for many of the athletes. Click PLAY or watch day 1 on Vimeo. Click PLAY or watch day 2 on Vimeo. Click PLAY or watch day 3 on Vimeo. Next camp is July 2017.